Blood vessels become more prominent during and after exercising as a result of normal physiological processes; swelling decreases after you're done working out. If swelling does not subside, you may have varicose veins, which can cause pain and ulcers. In contrast, blood vessels that "pop" out after exercise are not typically painful. Talk to your doctor if your veins cause pain or other symptoms. A complex series of arteries, arterioles and capillaries carry blood away from your heart, while veins and venules transport it back to your heart. During exercise, your heart works harder to deliver blood and its nutrients to active cells. Arteries receive more blood and more pressure during exercise. Systolic blood pressure -- the amount of pressure on the vessel walls -- rises with exercise intensity. It increases to "nearly 200 mmHg during high intensity aerobic exercise and to more than 400 mmHg during weight lifting," reports a November 2006 article in "Scientific American." Veins constrict to force blood towards the heart, however, reducing overall pressure in venules and veins. During or after exercise, veins swell and push toward skin as a result of plasma rather than venous blood pressure. The increase in arterial blood pressure affects plasma fluid in capillaries. Typically resting in the capillary, plasma is forced out through the vessel's thin walls and into compartments surrounding muscles. As a result, muscles swell and harden, pushing cutaneous veins -- or those under your skin -- upward and outward into view. The less subcutaneous fat you have, the greater your chance of seeing veins during exercise. If your veins constantly remain swollen, they might be varicose. Often twisted or "spidery," varicose veins commonly affect older adults, pushing through the skin of the legs and sometimes arms. Though not typically harmful, varicose veins can cause pain, blood clots, skin ulcers or other complications. Unlike swelling experienced from exercise, varicose veins occur when the valves in your blood vessels become weak. Valves are one-way; they keep blood from flowing backwards. A malfunctioning valve allows blood to pool in the vessel, causing swelling and eventually leading to varicose veins. Obesity, lack of exercise and sitting for prolonged periods increase the likelihood of developing varicose veins. 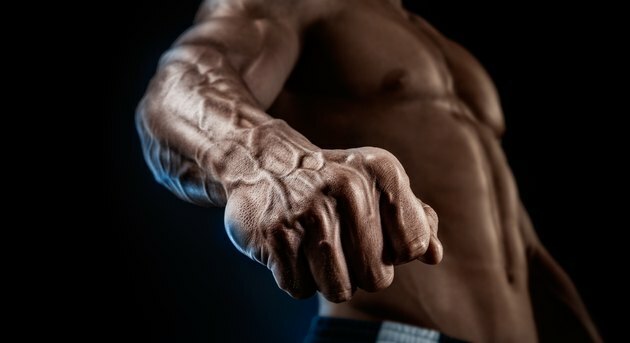 Experiencing swollen veins during or after exercise is a normal biological process. If swelling subsides soon afterwards, there is no cause for alarm unless you experience pain or other symptoms. Talk to your doctor if this is the case. Varicose veins remain swollen and visible with or without exercise, but are likely not a medical emergency. Procedures to treat them are available.